I hope all of you are having a great holiday… and to any of you that serve our country, a very big thank you! We’ve been busy enjoying family, friends and spectacular weather… so far we’ve managed to dodge the little bit of rain they were predicting! This recipe is really easy and it can be tailored to suite just about any food preference. 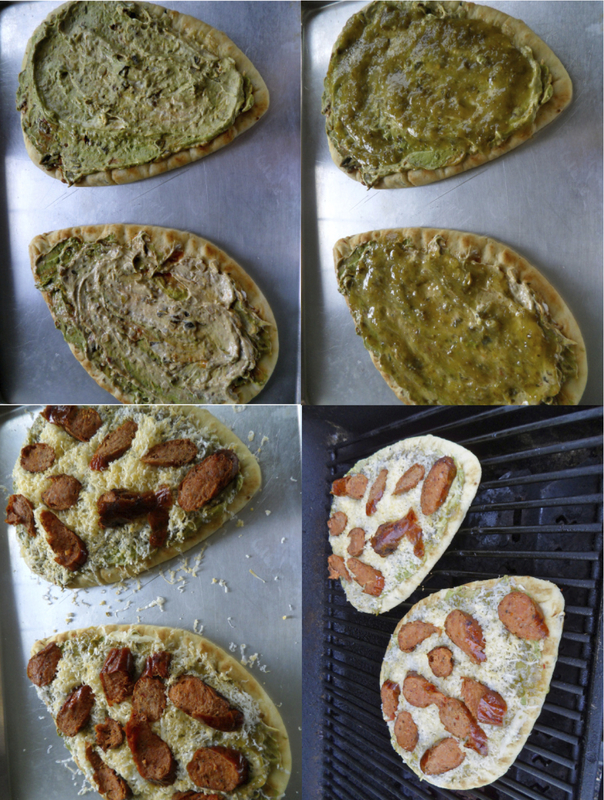 I like making individual pizzas on naan bread… it’s delicious and thick which makes it really easy to throw on the grill! 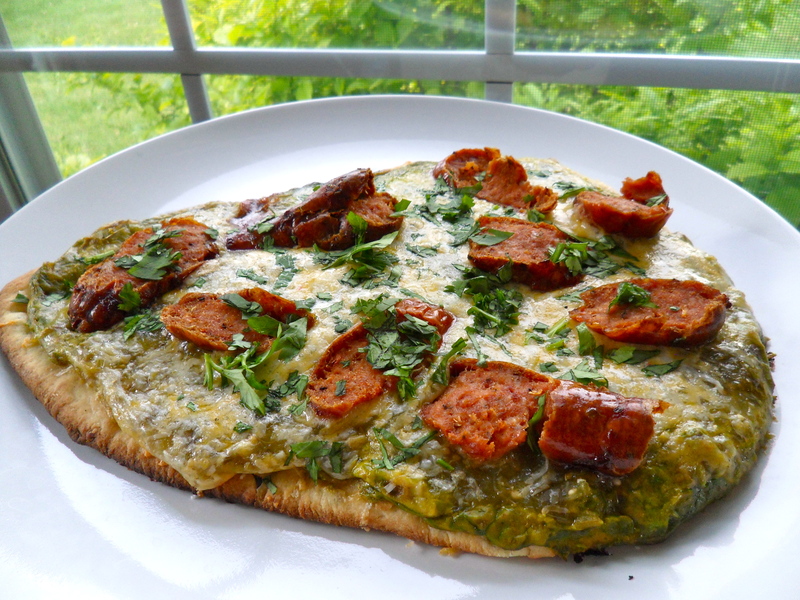 We had leftover bean dip from this weekend (which I’m sure almost all of you have come across at some point over the last 3 or 4 days) so that served as the “sauce of our pizza” which was then smothered in salsa verde and grated cheese and topped with grilled chorizo sausage and cilantro. Kind of random combinations (especially the fact that it’s a Mexican pizza built on an Indian bread) but trust me, it is SO good! Grill two links of chorizo sausage basted in a little oil. Cut into slices and set aside. Start with two pieces of Naan bread (we made one pizza for each of us, but you could easily feed a couple people with one pizza if you’re serving something else). Spread with bean dip (like I said earlier, we had some leftover from parties this weekend but if you don’t you can just get a can of black beans and mash them with the back of a spoon and add a little salt, pepper, cumin and chili powder to it). Cover that with a layer of salsa verde. Grate a good amount of cheese over the dip and salsa. I used Pepper Jack cheese and Colby Jack Cheese just because that’s what we had but you can use any kind you like! Top with the slices of chorizo. Carefully put the pieces on the grill and put the top down. All you want to do here is crisp up the bottom of the Naan and melt the cheese. Once the pizzas are done on the grill, sprinkle with some chopped cilantro and serve hot! Thanks! The flavors went together SO well and I like being able to finish them on the grill… it’s so easy and it’s a nice change up from the oven! Great recipe. I love to use flat bread for quick pizzas. Such a great alternative to save time while keeping flavor!